The posteromedial corner (PMC) of the knee is the oft-forgotten sister of the much-studied posterolateral corner and, as such, injuries to the PMC are not always considered. The high incidence of missed or inadequately treated associated injuries in the posterior cruciate ligament (PCL)- deficient knee may explain why some authors have described unfavourable outcomes at midterm follow-up. Injuries to the PMC may go unrecognised due to the fact that the phrase ‘medial-sided injury’ has become synonymous with medial collateral ligament (MCL) sprains or tears, the majority of which have excellent outcome from non-operative management ; however, unlike low-grade MCL tears, injuries to the PMC are unlikely to heal, particularly in the setting of a multi-ligament injured knee. In addition, persistent valgus or posteromedial instability can place additional strain on a reconstructed PCL and potentially cause late graft failure [1,2]. The anatomy of the medial side of the knee can be described from anterior to posterior, extending from the medial border of the patella to the medial edge of the PCL. The anterior third comprises the extensor retinaculum of the quadriceps femoris muscle. The middle third consists of the deep MCL (dMCL) and the superficial MCL (sMCL). The posterior third represents the PMC. 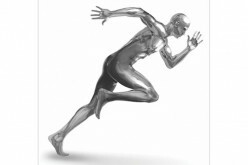 Biomechanical and anatomical studies have demonstrated that the key functional structures include the posterior horn of the medial meniscus, the posterior oblique ligament (POL), semimembranosus tendon and insertions, meniscotibial ligaments, the oblique popliteal ligament and the posteromedial capsule [3–7] (Figure 1). 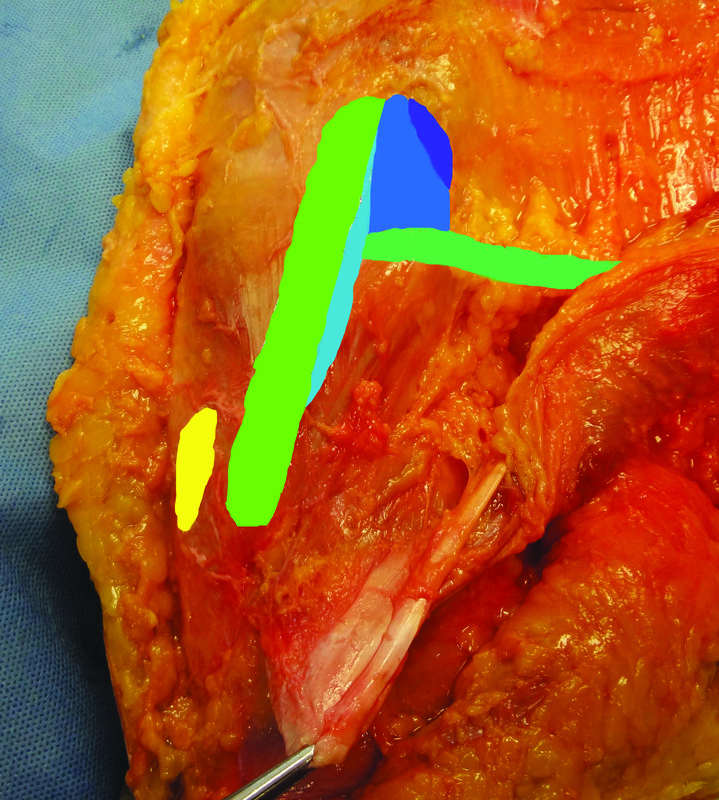 Figure 1a and 1b: The anatomy of the posterior medial corner including the hamstring tendon attachment (yellow), sMCL (bright green), fascial arm POL (light blue), central arm POL (mid-blue), capsular arm POL (dark blue), semimembranosus tendon (dark green). The POL comprises superficial, central and proximal branches. The origins of the superficial arm fibres blend in with the posterior border of the sMCL anteriorly and course into the other arms of the POL inferiorly and posteriorly. The central arm is the main component of the POL, arising from the semimembranosus tendon, reinforcing the dMCL directly attaching to the posterior joint capsule and posterior meniscus, and blending with the semimembranosus attachment on the tibia. 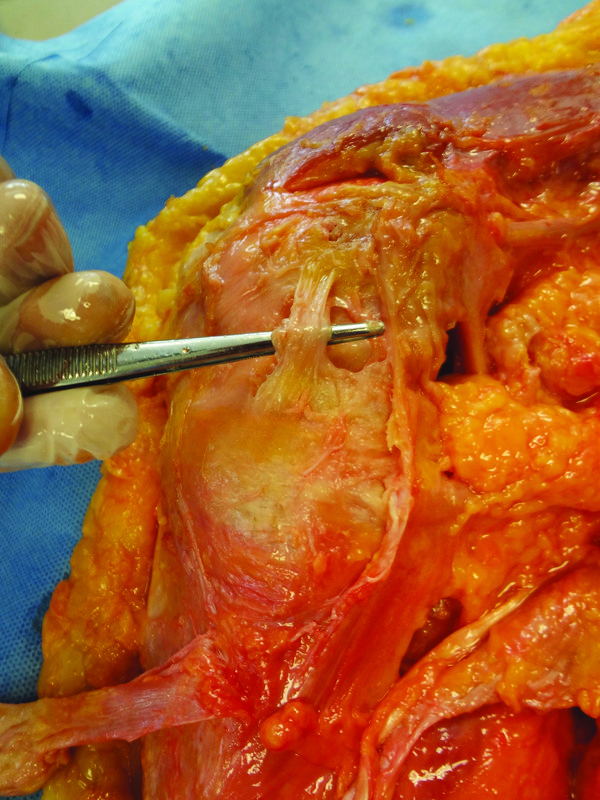 The capsular arm comes off the distal aspect of the semimembranosus tendon, attaching to the meniscofemoral portion of the joint capsule and medial head of the gastrocnemius and over the adductor magnus [1,5,8]. On average the POL attaches on the femur 7.7mm distal and 6.4mm posterior to the adductor tubercle and 1.4mm distal and 2.9mm anterior to the gastrocnemius tubercle  (Figure 2). The PMC has been described as a synergistic muscle–ligament–meniscal unit, with all of the structures working together to provide stability. The semimembranosus muscle has multiple attachments to the tibia and provides a dynamic component to the PMC. The anterior arm of the semimembranosus attaches to the tibia deep to the proximal attachment of the superficial MCL, whereas the direct arm attaches posterior to the medial tibial crest. In extension, it acts as a restraint to valgus and in flexion it restricts but also tightens the PMC via its attachments to the POL and posterior capsule. The resulting posterior retraction of the posterior horn of the medial meniscus serves as a restraint against anterior tibial translation via the ‘chock block’ effect . 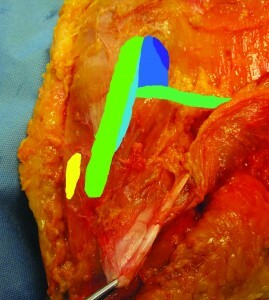 Figure 2a and 2b: The sMCL reflected to demonstrate the femoral footprint of the sMCL (bright green), dMCL (purple), fascial arm POL (light blue), central arm POL (mid-blue), capsular arm POL (dark blue), semimembranosus tendon (dark green) and the medial gastrocnemius tendon (red). The PMC is a primary stabiliser of the extended knee, providing approximately one-third of the restraint to valgus stress; however, with flexion, the PMC slackens, causing the superficial MCL to become the primary stabiliser to valgus stress across the remainder of the flexion–extension arc . The POL is a primary stabiliser for internal rotation at all knee flexion angles. The PMC is not a significant restraint to tibial internal rotation above 30 degree flexion but is the primary restraint near full extension. The fibres of PMC are slackened by tibial external rotation and therefore do not contribute to restraining this movement unlike the sMCL and dMCL . The PMC is an important secondary restraint to posterior tibial translation (PTT) in the PCL-intact knee. It has been shown to resist 28 per cent of the posterior tibial load when the tibia was free to rotate, rising to 42 per cent when the tibia was internally rotated; however, the PMC becomes the primary restraint to PTT in the PCL-deficient knee . A spectrum of medial-sided injury can occur after application of a valgus force to the leg. This can range from isolated MCL injury to involvement of the PMC, which is more likely if there is high-velocity trauma or an external rotation component to the forces involved . For an isolated superficial MCL injury, the greatest joint space opening occurs with the knee in 30 degrees of flexion. Joint space opening with the knee fully extended indicates an injury to the capsule, the POL, or both . In combined PCL–PMC injury a posterior drawer test is performed, with the knee flexed at 90 degrees and the foot in neutral rotation, and repeated with the foot 10 degrees internally rotated. 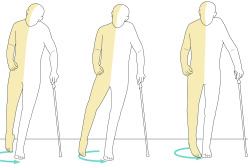 The PMC acts as a secondary stabiliser with an isolated PCL injury, decreasing tibial translation when the foot is held in internal rotation [1,11]. Anteromedial rotatory instability is detected by performing the anterior drawer test while holding the tibia in external rotation. Any evidence of anterior subluxation of the medial tibial plateau during a valgus stress test with the knee in 30 degrees of flexion might also indicate the presence of anteromedial rotatory instability . All patients should have plain radiographs but stress radiographs can also be useful to assess the degree of medial opening and PTT. Garavaglia and co-workers reported that greater than 12mm of posterior translation at 80 degrees flexion was indicative of combined PCL–PMC injury . MRI is also useful in the evaluation of the PMC. Chahal and colleagues reported MRI findings in 27 consecutive knee dislocations and found evidence of injury to at least one structure in the PMC in 81 per cent (22/27) of knees – demonstrating the frequency with which these injuries occur . The immediate management of knee dislocation should be conducted with respect to standard trauma care principles and life-threatening injuries treated first. Neurological and vascular assessment of the limb are mandatory. Provided that no emergency management is required, then the affected limb can be placed into a cricket pad splint while awaiting further imaging, assessment and definitive surgical management. Non-operative management is not recommended for combined PCL–PMC injuries. 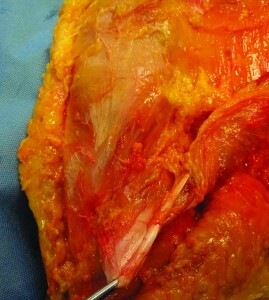 Currently there is no evidence regarding the optimum timing of surgery but it should be noted that in those patients with chronic injuries (defined as over three weeks since the injury) primary repair is usually no longer possible due to abundant scar tissue and the focus of treatment becomes restoration of range of movement prior to elective surgery . When planning the timing of surgery it is important to note that multiligament injuries repaired acutely have less articular and medial meniscal damage than do those repaired more than one year after the injury . 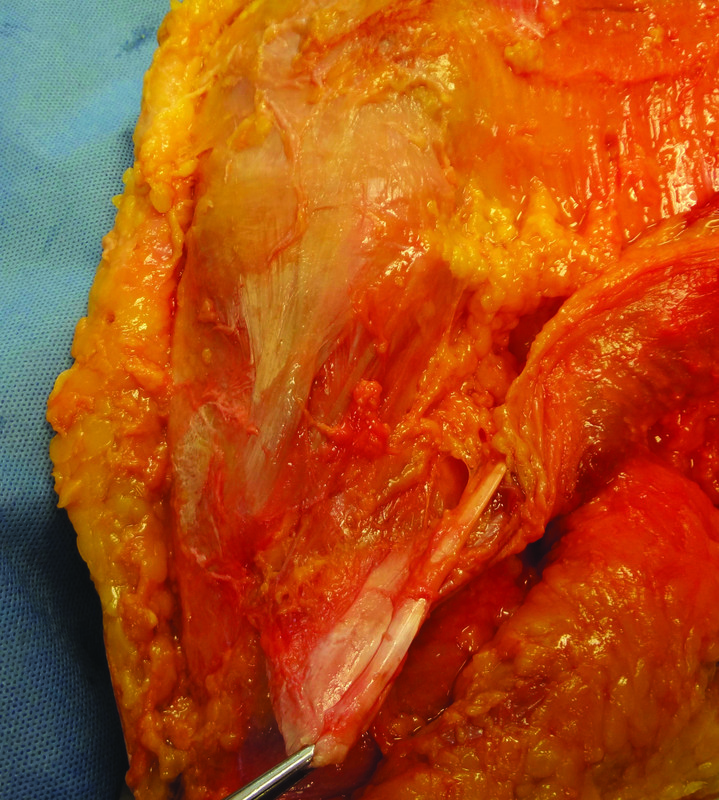 In addition to PCL reconstruction, arthroscopy may be used before the open procedure to evaluate intra-articular pathology and perform debridement/meniscal repair as indicated; however, care must be taken to avoid significant fluid extravasation. Other arthroscopic findings may include posterior capsular haemmorhage, pathologic medial ‘meniscus rise’ (meniscus lift off from the tibia during abduction stress testing at 30 degrees flexion) and the ‘arthroscopic spin sign’ (excessive rotation of the tibia beneath the medial meniscus) . There are no clinical studies directly comparing repair versus reconstruction of the PMC; however, Stannard reported failure rates of 4 per cent (PMC reconstruction) and 20 per cent (PMC repair) [16,17]. It seems, therefore, that reconstruction may be preferable but it is useful for surgeons to also be familiar with techniques for acute repair and capsular retensioning procedures [10,15]. A number of techniques have been described but there is limited clinical outcome and biomechanical data to enable comparison between them. The author’s preferred technique is the Stannard modification of the Kim procedure. This technique uses semitendinosus autograft [11,16,17]. This is harvested but left intact at the tibial attachment. Fluoroscopy is used to identify the isometric point for the femoral tunnel, which is located at the intersection of a line drawn down the anterior aspect of the posterior femoral cortex and Blumensaats line. The tunnel is directed approximately 30 degrees proximally and 30 degrees anteriorly to avoid interference with tunnels for ACL, PCL and posterolateral corner reconstructions. A bicortical 4.5-mm screw and an 18-mm spiked ligament washer are placed at this isometric point and inserted approximately three-quarters of the way in. 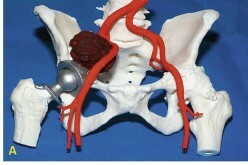 Decortication of the femur is performed for a radius of approximately 6mm under the washer. The semitendinosus graft is then passed around the screw and washer, under the direct head of the semimembranosus tendon, and then back to the intact insertion on the tibia. The graft is then tensioned with the knee in approximately 40 degrees of flexion and a slight varus stress. The screw and washer are tightened down to the femoral condyle and the graft is sutured back to the insertion of the semitendinosus. The stability of the PMC is then assessed. If it is not as tight as desired, it can be further tightened by suturing the two limbs together distally in a V–Y fashion. This technique requires the use of only one graft and one drill tunnel, which makes it very simple to perform but results in a non-anatomic reconstruction; however, the results are excellent with only a 3.7 per cent failure rate at a minimum follow-up of two years [11,16]. 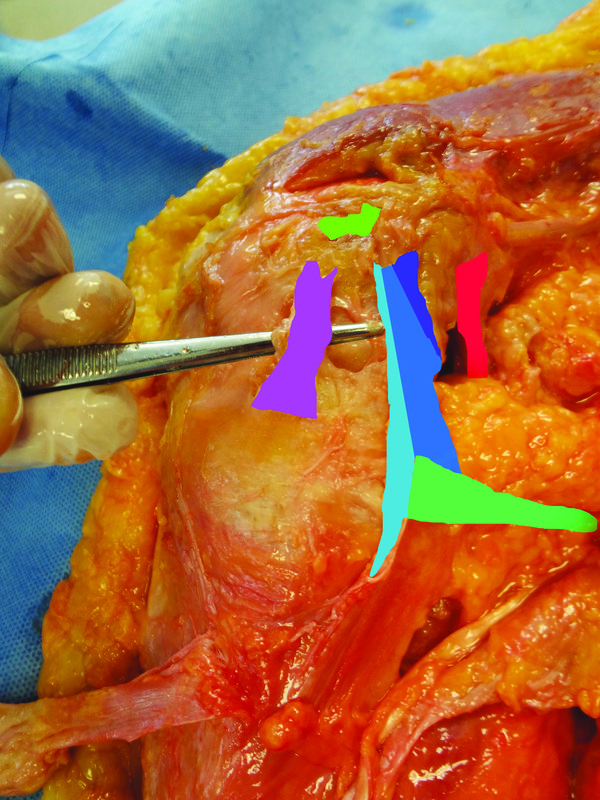 Anatomic reconstructions using two grafts and four tunnels have been reported  and although there is a logical merit to the philosophy of anatomical reconstruction, surgeons should consider the risk of tunnel collision with other reconstructions, complexity of surgery, total operating time and the lack of clinical data to show an advantage of one technique over another when performing pre-operative planning. 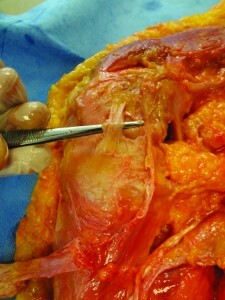 Another consideration is that the availability of autograft may be limited in a multi-ligament scenario and therefore it may not be possible to use the aforementioned technique; however, this technique can also be performed with slight modification if allograft is used (either one large tibialis anterior tendon split in half or two semitendinosus tendons). The grafts are fixed in the femoral tunnel using a biotenodesis screw with one limb representing the MCL and the other the POL. A tibial tunnel is drilled at the point of insertion of the conjoined tendon of semitendinosus and gracilis. A 4.5-mm screw with a ligament washer is placed into the drill hole and inserted three-quarters of the way into the bone. The knee is then flexed approximately 40 degrees and a slight varus stress is applied. The two grafts are passed around the screw in opposite directions and tensioned, and the 4.5-mm screw and washer are tightened securely to the tibia. Results with the allograft technique have also been good, with only a 4.8 per cent failure rate in knee dislocation patients with a minimum two-year follow-up [11,16]. It is recommended that the PCL reconstruction is performed first without tensioning or fixation of the graft on one side (e.g. 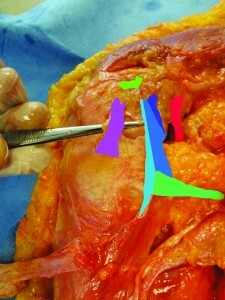 the femoral side if an inlay technique is used), followed by reconstruction of the MCL/PMC again without fixing. Once the PMC graft is in place, the PCL is tensioned and fixed. The final step is fixation of the PMC graft [11,19]. There is little consensus on the best way to rehabilitate a knee following PCL and PMC/POL repair or reconstruction. Bonasia and co-workers recommended that the patient be kept in a hinged knee brace with protected weight-bearing for six weeks and restriction of motion to between 0 and 90 degrees for two weeks ; whereas Fanelli and Marx both advocate that the knee is braced in full extension and non-weight-bearing for a number of weeks – followed by progressive range of movement and full weight-bearing around six weeks postoperatively. There appears to be a high incidence of unrecognised injury to the PMC, particularly in the multiligament injured knee. Failure to address this can result in failure of cruciate ligament reconstruction. Adnan Saithna is a consultant sports injury knee and shoulder surgeon at Southport and Ormskirk Hospitals. He is also an honorary senior lecturer in the department of musculoskeletal biology at the University of Liverpool.